Start your college career out right by serving with us. Join your fellow new Ducks to discover service-learning and community service at the UO and in Eugene. 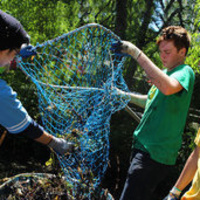 Connect with other UO students as you serve alongside organizations contributing to the well-being of our communities. Select from several different projects around Eugene-Springfield. The Holden Center will be collaborating with numerous campus and community partners, hosting several service projects around Eugene-Springfield. Details about each opportunity will be sent to all pre-registrants the week before the event for preferred placement. All non pre-registrants will sign up the morning of the event. Project sign-up will be first come, first served the morning of Saturday, Sept. 22. Details about the sign-up and schedule will be sent to registrants the week before the event. Check-In & Refreshments: 9:30 A.M. Depart to Projects: 10:30 A.M. Conclusion & Lunch: 2:00 P.M. - 3:30 P.M.